You'll be £2.99 closer to your next £10.00 credit when you purchase With The Royal Navy in War and Peace. What's this? The Royal Navy that Brian Bethen Schofield joined at the beginning of the Twentieth Century truly ruled the waves. Safe anchorages spanned the globe and faster, better armoured ships with revolutionary weaponry were coming into service. O’er The Dark Blue Sea is a superbly written memoir offering a fascinating insight into a bygone era. Anyone with more than a passing interest in British naval history will enjoy the Author’s graphic yet modest account of an exceptional career. With a naval career that saw service throughout both World Wars, Admiral Schofield’s story is one that fully justifies publication. He recorded his recollections and these have now been edited by his daughter, with some added background notes. This is a highly enjoyable read. Schofield ‘s career from coal fired ships to the major fleet actions in the Pacific, included the relaxed life of an officer in the peacetime Royal Navy between the wars. Her final words in her foreword sum him up succinctly – “in body and spirit Schofield was a sailor all his life”. Highly recommended. 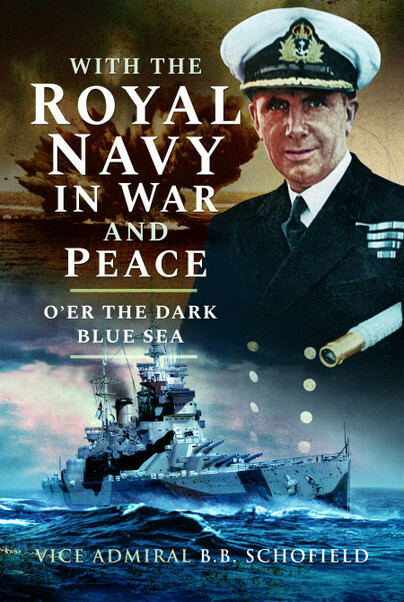 These unique memoirs are a modest account of an outstanding naval career. They are very well written in an engaging style and provide a colourful picture of the Royal Navy in a tumultuous half century. The text is supported by a photo-plate section with an interesting selection of images. The book is well written in the first person and moves nicely through his career... An enjoyable book. This memoir, written in a graphic yet modest style, is a fascinating insight into a bygone era. The book is fittingly edited by his daughter Victoria, an historian and commentator. Brian Bethem Schofield served in the Royal navy for some 36 years rising to the rank of Vice Admiral before retiring in 1950. This memoir covers his distinguished career in war and peace. In retirement he wrote numerous works of naval history including Operation Neptune and Stringbags in Action (both in print with Pen and Sword Books).